I first made these a few years ago for my sister-in-law’s baby shower. The were a huge hit, but somehow the recipe got buried in my mass of kitchen paper and was forgotten until I was searching for tea sandwich ideas. Voila! Perfect! The curry is very subtle, even folks who claim not to like curry gobble these babies up. You can add chopped blanched almonds or pecans to this chicken salad if you like – but keep in mind your guests. I have a couple “anti-nut” people in my life, so I steer clear of adding them to dishes. Aren’t I nice? In a bowl, combine the first five ingredients. Combine mayonnaise, lime juice and curry powder; add to chicken mixture and stir to coat. Cover and refrigerate until ready to serve. 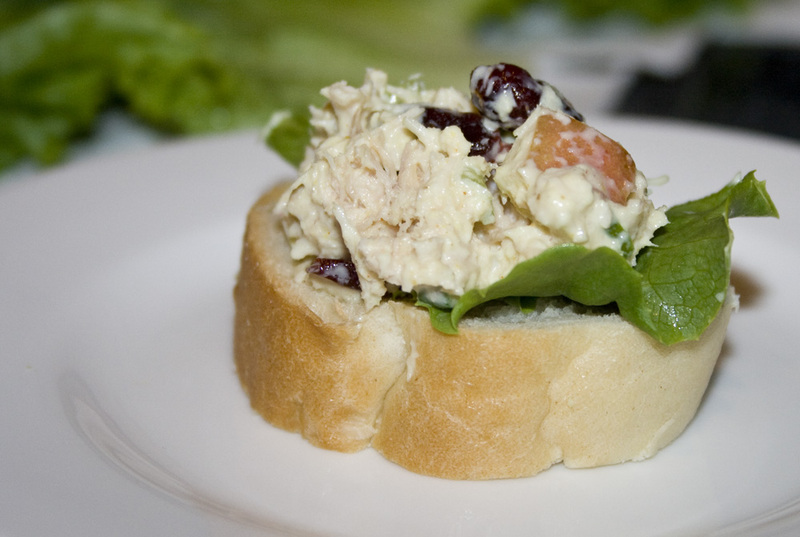 Place lettuce on baguette pieces, top with lettuce and chicken salad. You get chicken in a can? I have never seen that before. I love snacky food like this – it always taste nicer in dainty bite size pieces. Yes. It’s like tuna in a can (do you get that?) – but chicken. It’s way easy and quick. Oh okay cool thanks – yip, we get tinned tuna.